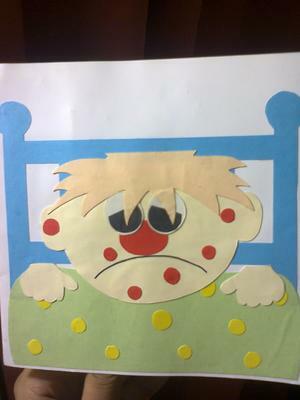 This is just a simple 6x6 card I made for my cousin when he was in bed with chicken pox. It is made using a pearl white card stock. I have only used colored paper for this card along with the white card stock. It took me only about one hour to complete this card. I'm new to card making, but the ones I make are available for purchasing too. Still I haven't got a good market for them since I have not advertised them anywhere properly. 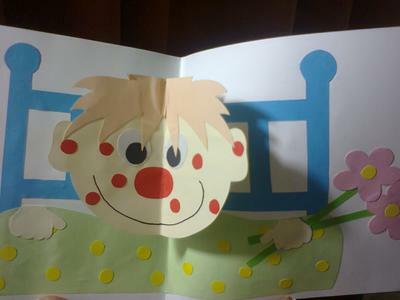 This is a cute card and I am sure it made the recipient smile even if he did have Chicken Pox... and he was sure to feel better after that. I love the red spots on the face and the pop out way you have created it. Love the card and to say you are new to card making you do a very good job.